for you and your family. 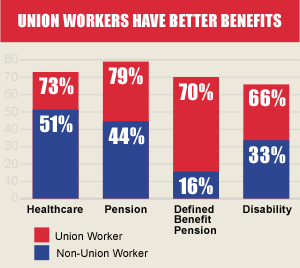 Union workers make 30% more than non-union workers! * As a union members, we bargain collectively with our employers to receive better wages, benefits, and treatment in the workplace. Most of us have very limited bargaining power as one person, but as a group, we are strong. With a good negotiated contract, we have legal protections we would not have otherwise.